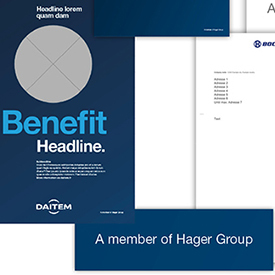 The latest information about Hager Group Corporate Branding. We now only have one document for those both topics. You can find all the different ways to create illustrations as well as our new communication icons style. This style has slightly evolved since the launch of new branding. 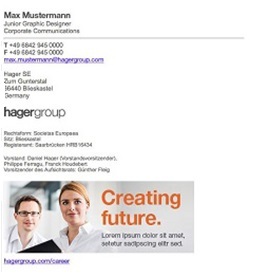 As you may know, from January 2018, all Master Brands, except Hager, must use the endorsement notice “A member of Hager Group” in their communication tools. In com2web you’ll find a guideline explaining how to apply it in the most frequently used communication tools and also all the company templates with endorsement notice for each brand. A guideline is available to help you create banners in your e-mail signature. You can find it on com2web. You can create a banner if you’re still using the manual signature but we recommend to try to adopt the automatic signature tool. 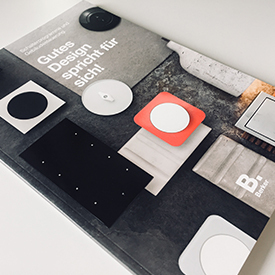 Last year, the German market has been working on a wiring accessories brochure into the new Corporate Design. Since then, this really represents a reference in the way to display wiring accessories and to put emphasis on the product design. An English version with Hager brand is also available on the PIC Platform. Find all the documents related to branding on our com2web platform. If you do not have your IDs yet, we invite you to create them. Do not hesitate to contact Cécile Franck Weyhaubt or Jean-Guy Dietrich for any other question. If you wish to unsubscribe, please contact Cécile Franck Weyhaubt.